Every set of hands make the work lighter and the applause louder. There are over 1,500 volunteers that support Double H Ranch on a year-round basis. Our pursuit of the greatest, safest camper experience will always include recruitment of caring and qualified volunteers. Whether you have a day, weekend, week or an entire summer, our camp offers a range of volunteer opportunities for you to make a difference by giving your time and talent. Looking for Employment Opportunities? We are currently hiring positions for our Summer Camp! Camp On-The-Go — Our Hospital Outreach Program allows us to bring the magic of camp to children and families in a hospital setting. Camp On-The-Go volunteers must be age 18 years of age and previous experience as a Summer Staff member or Session Volunteer at Double H Ranch in the past. Gift Shop – Having the Gift Shop open requires responsible individuals to process purchases, and re-stock items as necessary. Housekeeping – The Housekeeping Department loves to have assistance with folding linens, washing bedding and other general duties, especially during program changeovers. Questions? Please contact us at 518-696-5676 or e-mail volunteer@doublehranch.org. The Double H Ranch is a 501(c)(3) nonprofit organization. 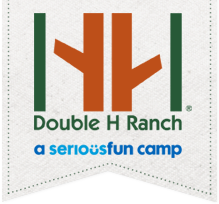 The Double H Ranch is a member camp of the SeriousFun Children’s Network, a non-profit umbrella organization with a community of 30 camps and programs worldwide serving seriously ill children and their families. Each member camp, including Double H Ranch, is an independent, not-for-profit organization dependent upon private funding to serve all children at no cost to their families.